All new for 2019, we are proud to introduce the latest generation of Experts™. Featuring actions tuned through close consultation with the Falcon pro-staff like Bassmaster Elite Series anglers Jason Christie and Mike McClelland, our all-new, top-of-the-line, Expert Series rods are built with one purpose in mind. Winning. It all starts with the blank. To enhance power-to-weight ratio, we use CrossMatch™, our all-new, state-of-the-art composite of Japanese carbon whose multi-layer, cross-directional fibers boost strength while requiring less material and resin. The result is a rod that’s significantly lighter, incredibly muscular, and considerably more sensitive. Other benefits include superior resistance to torsional deflection. In other words, the blank resists rollover or twist which can help increase cast accuracy. Like all Falcon rods, Expert Series components are 100% Fuji – from the reel seats to the tangle-free K Frame guides. Whether you’re a tournament pro, or just want to fish like one, you just can’t lose with Falcon’s new Expert Series rods. Jerkbait- This true jerk bait rod has a lighter action to work the bait properly and get the right hookset. Top Water / Finesse Jig- Our popular finesse jig action take a new level with Expert technology. All-Around- One of our most popular actions makes a great crankbait rod but can do almost everything. Deep Cranker- Choose this Expert for extra long casts with crankbaits. Spinnerbait/Chatterbait- This Expert works great for bladed baits or anything that needs an accurate presentation. Buzz Bait- A heavier version of the "All-Around" for large buzzbaits and crankbaits. Dragger/Heavy Cover Jig- Originally designed for football jigs, this Expert can also drag a Carolina rig with some precision. Froggin'/Pitchin'- A true frog rod, it's soft enough for subtle action but powerful enough to deal with matted vegetation. Amistad- One of our most popular actions makes an excellent all-around pitching rod. Swimbait- With it's dynamic action, this Expert can load up and deliver a swimbait without missing a beat. XD Cranker- For long casts with extra large crankbaits, there is no subsititue. 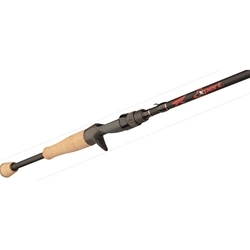 Amistad XH- This Texas style power rod also makes a great swimbait rod. Flippin'/Punchin'- A light and powerful flipping stick, this 8' Expert makes it easy. Please Note: This item is considered an “Oversized” Item; therefore, you will incur a $10.00 shipping fee that will be charged after submitting your order. If you have any questions please feel free to contact us.